When: Saturday, August 29, 4 p.m. (PT). Series History: San Jose leads the regular season series 3-0. Note: Due to the circus booking the SAP Center for two weeks, the game will be played 82 miles northeast at the Stockton Arena in Stockton, CA. The Sharks finished the regular season 10-8 overall, 5-4 on the road and 2-2 in inter-conference play. Jacksonville is coming off a 61-56 road win over the Philadelphia Soul in the American Conference Championship on August 23. They averaged 53.9 points per game (5th in the AFL) and allowed 50.1 points per game (4th). The Sharks finished second in the Southern Division and third in the American Conference. The SaberCats finished the regular season 17-1 overall, 8-1 at home and 4-0 in inter-conference play. San Jose is coming off a 70-67 home win against the Arizona Rattlers in the National Conference Championship on August 22. They averaged 58.9 points per game (1st) and allowed 36.8 points per game (1st). The SaberCats finished first in the Pacific Division and first in the National Conference. The Sharks are the first team in AFL History to make it to the ArenaBowl after beginning the season 0-4. The team would finally get a win against the Las Vegas Outlaws, but a week later they would be blown out by in-state rival Tampa Bay. With a 1-5 mark, many wrote the Sharks off as a team that was over-hyped before the regular season began with acquisitions of top talent in Tommy Grady, Derrick Ross, Tiger Jones, Joe Hills and Joe Sykes. But then the Sharks went on a hot streak, winning 5 straight games to get back into the playoff hunt and enter the playoffs winning 9 of their last 12. Despite making the playoffs, the Sharks were a prime example of Jekyll and Hyde, especially with clunker games versus Tampa Bay, Portland, and Orlando. The Predators were confident that they would be able to handle the Sharks, proclaiming that they "owned the south." Jacksonville would reclaim the ownership, jumping out to a 35-14 lead at halftime and winning the game 55-33. Jacksonville went on to play in the National Conference Championship game against the Philadelphia Soul, who had beaten the Sharks in back-to-back conference final games in 2012 and 2013. The Sharks wouldn't allow themselves to be kicked out three of the last four seasons by the Soul, taking a commanding 28-14 lead going into halftime. The Soul would roar back in the second half, keeping the game close. Jacksonville had a chance to put the Soul away late in the 4th, but questionable play calling and a missed field goal attempt kept Philadelphia's hopes alive. In the end, the Sharks would hold on as LaRoch Jackson intercepted a Dan Raudabaugh pass in the end zone to punch Jacksonville's ticket to the ArenaBowl, defeating the Soul 61-56. With the AFL's single season sack record holder Joe Sykes out with a season ending leg injury, the Jacksonville defense is going to have to step up against a powerful San Jose offense. However, the key to the victory will be QB Tommy Grady. Grady, acquired after the Pittsburgh Power ceased operations, will be playing in his first ArenaBowl game. Prior to this season, the 2012 league MVP only had one playoff win. Grady has numerous individual and career records. Here's a look at what Grady has done in his six-years in the AFL, playing for Oklahoma City, Utah, Pittsburgh, and Jacksonville. He also owns the several single season passing records. In his 2012 MVP campaign with the Utah Blaze, Grady set records in passing yards (5,870), touchdowns (142), passing attempts (743), and completions (507). The Sharks had to ride Grady's arm against Philadelphia, where he threw for 238 yards and 8 passing touchdowns--all on 15 completions. San Jose's defense isn't the same as Philadelphia's, meaning Grady won't have as many opportunities for deep passes. He'll have to improve on his completion percentage, as the 51.7% he had against Philadelphia won't get the job done if the Sharks want a second ArenaBowl title. ArenaBowl XXIV: The 2011 season was a huge step forward for the Sharks as the second-year franchise made it to the big game. It was one of the most memorable ArenaBowls as WR Jeron Harvey caught the game winning 10-yard TD pass from QB Aaron Garcia with 0:00 left on the clock as the Sharks defeated the Arizona Ratlers 73-70 in Phoenix to capture its first title. San Jose's talent hording finally paid off with a historical 17-1 record, making them the second team in AFL history (Cleveland in 2014) to eclipse 17 regular wins in a single season. They also set AFL records for most consecutive road victories (10), largest margin of victory (22.2 points) and total sacks (45). The SaberCats were truly tested last week. Not only did they have to play their "home game" at Stockton Arena, they had to overcome the Arizona Rattlers, who had eliminated the SaberCats from the playoffs the past three seasons. They scored 22 points in the final three minutes of the game. Down 63-67, the SaberCats marched downfield and scored on a controversial touchdown by Reggie Gray with 8 seconds left. The play was reviewed, but eventually upheld because there was no camera angle that could determine whether or not Gray fumbled the ball before crossing the goal line. 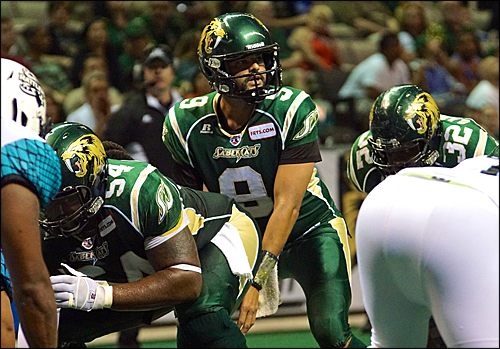 The SaberCats were able to win and make it to the ArenaBowl, eliminating the 3-time defending ArenaBowl champs. This is the technically first ArenaBowl for Erik Meyer, the prized quarterback the SaberCats acquired after spending 5 seasons in Spokane. 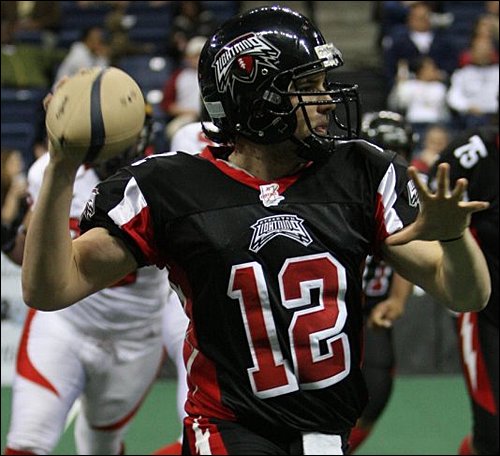 He won an ArenaBowl title with the Shock in 2010, but he was on the injured reserve list at the end of the season and didn't participate in the game. Prior to 2015, Meyer was 1-3 as a starter in the playoffs. As good of talent he has around him, there's a considerable amount of pressure on him to win an ArenaBowl. Despite missing 3 games due to a back injury, Meyer managed to have a statistically good year with a 66.9 completion percentage, 4,057 passing yards, 93 touchdowns and 6 interceptions. If Jacksonville gets pressure in Meyer's face, it could be problematic. In the lone loss the SaberCats had this year, the LA KISS defense got in his face and forced him to make bad throws, resulting in a season low 47.6 completion percentage and 3 interceptions. Meyer has plenty of receivers at his disposal, so as long as he gets good protection from his blockers, he'll likely pick apart the Jacksonville defense, especially since sack leader Joe Sykes is out for the game. If he gets in a groove and has little to no pressure in his face, Meyer could be hoisting the ArenaBowl trophy and be named the game's MVP. ArenaBowl XVI: San Jose won its first ArenaBowl title at home versus the Arizona Rattlers in 2002. The SaberCats defeated the Rattlers 52-14. ArenaBowl XVIII: Two years after, the Rattlers and the SaberCats faced off against each other once again, this time in Phoenix. The score was much tighter than the game from two years earlier, but the SaberCats pulled away in the final 30 seconds of the game to win 69-62. ArenaBowl XXI: In 2007, the SaberCats returned to the ArenaBowl, but the ArenaBowl was a neutral site game in New Orleans. The SaberCats found themselves in a tight game with the Columbus Destroyers, leading 34-27 going into the 4th Quarter. San Jose would go on to dominate the final frame, defeating the Destroyers 55-33. ArenaBowl XXII: The SaberCats returned to New Orleans with intentions to repeat, going up against the Philadelphia Soul, owned by rock star Jon Bon Jovi. The Soul held a 52-42 lead going into the final 40 seconds of the game. San Jose would mount a comeback to cut the lead to 3, but the Soul hung on to win 59-46. Sharks head coach Les Moss on his tearful breakdown after defeating Philadelphia. 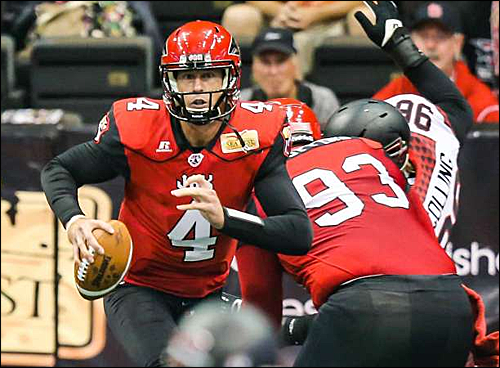 QB Tommy Grady on criticism of not having an ArenaBowl title. "People's legacy – me, I don't have a championship. I think winning a championship is big for me and for our team. I think we're ready for the challenge." SaberCats OL Richie Ranglin on San Jose being forced to play in Stockton. The San Jose SaberCats are not the first and only team to play "home games" at the Stockton Arena. Believe it or not, the city of Stockton is quite familiar with arena football. In fact, Stockton used to have an arena football team called the Stockton Lightning, and they played in the af2. Stockton was awarded an af2 expansion team in 2005 and were owned by Michael Reinsdorf, son of Chicago Bulls owner Jerry Reinsdorf. The team was named the Lightning as a result of a "Name the Team" contest. The team's colors were black, red, gray, and white. The Lightning played in the Western Division of the National Conference. In their four years in the af2, they were 22-43 overall, 12-20 at home and 10-23 on the road. The team never found consistency, alternating between 5-11 and 6-10 records every other year in their four year existence. Their best regular season record was in 2009, when the franchise went 6-10 and clinched the #8 seed in the National Conference playoffs, losing to eventual ArenaCup champion Spokane 62-21. When the 2009 season ended, the af2 disbanded when all 25 teams didn’t commit to the league’s eleventh season. This was due to the Arena Football League suspending operations in 2009 and eventually folding. Since the AFL owned 50.1% of af2, the AFL’s bankruptcy and dissolution brought about a grim outlook for all the teams, including the Shock. For legal reasons, the af2 league officials formed a new entity called Arena Football 1, with teams like the Arizona Rattlers and Orlando Predators joining the new league. The new entity would then form a new Arena Football 2 for the smaller market teams. While Spokane was set to join the AF1, Stockton would have joined the newly formed AF2. When AF1 bought all the assets of the former AFL that were put up for auction, it became clear that the AF1 would re-brand itself as the AFL, killing any possibility of the two-tier system that had been in place since 2000. "It is with a great deal of disappointment that the Stockton Lightning have decided to suspend operations for the upcoming 2010 football season. With the transition of the AFL and af2 developing into the new "Arena Football One" league, the proposed "lower tier" that was initially outlined did not become a reality. Furthermore, we have determined that the business model for the "upper tier", which caters to larger markets, is not financially sustainable for our organization at this time. For these reasons, we feel as though we have no other viable options to play arena football this season." In 2011, there were rumblings that the AFL wanted to bring arena football back to Stockton, but not under the Lightning brand. Football would eventually return to Stockton in the form of the American Indoor Football Association's Stockton Wolves, who recently relocated from San Jose after the SaberCats returned to the AFL. The Wolves were allegedly preparing to join the AFL, but that never came into fruition. Last Edit: Aug 28, 2015 0:03:22 GMT -8 by David: Font Format. I have to be honest. I am not thrilled with either participant. Wide knowledge has it that both have cheated to get where they are. Of course, the AFL will not do anything about it, especially to the Sabercats who are one of the league's darlings. I would probably hope that Jacksonville wins just for Coach Moss so he can dedicate it to his father. I liked the extra about the Stockton Lightning. It is too bad they folded and that the Wolves never happened. They would have been a great addition to an af2 type league. It's too bad the Lightning aren't around anymore. It'd be funny whenever they played Portland. HUGE props to David for this preview. I love when the playoffs come around in sports we cover. We really step up and put together the best previews and this is absolutely awesome! From what I know, this probably will be a better game than a lot of people think it will be. Angi says Jacksonville has a lot of talent and San Jose has a lot of good players too. I might just have to watch this one. That would be cool. Now we have to settle for when we play Tampa Bay. The Thunder-Storm! The game is actually televised in Australia, which is rare. I will tune in too! We are going to have a lot of people here. I am glad we will have a thread for it. It should be fun to watch! I'm glad everyone enjoyed the preview, especially the bit about the Stockton Lightning. They're a largely forgotten team for those that didn't follow af2 (or are just completely prejudiced against anything af2 related like some morons on ArenaFan), so it was awesome getting to share that bit of information. I'm hoping the game is going to be a good one since last year's game was basically over at halftime. I'm not wild about either team because of the paying-under-the-table knowledge regarding both, but I'll pull for Jacksonville on this one. I'd rather see Coach Moss win the title for his father than see $an Jo$e win a tainted championship. I hope it's a good game. I read about last year's game and it didn't look like it would have been very fun to watch. I saw a video at the end of the game between Jacksonville and Cleveland. I also hope the Jacksonville wins so their coach can win it for his father. I hope this is a good game at least. I had to pick San Jose. My wife is from there. 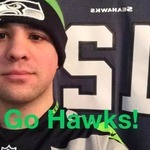 Hey all, would be cool if people are on here while the game is on. And sweeet Cam. Don't know your story, but hope you can see the game and enjoy it. Just FYI, I see as of now an opening (I think) college football game is showing on ESPN, just started the 4th quarter... Looking like this will run over pass the 7PM ET/4 PM PT kickoff time. A high school football game is showing on ESPN2, so likely the game will start on ESPNews or something. I don't get that channel so I'm hoping they will show the game on ESPN3 too if the college game is still going on by then. Just a heads up just in case. Enjoy the game who watch either way! Hey Para, we're getting close to game time! I hate when ESPNews starts games like this. I do not have that channel in my house. Cam is cool. He is from Melbourne, Australia and a big fan of American sports. This should be a lot of fun! Yes we are! Hope you can watch it. It might be streaming on ESPN3 if you have good access to it, just be ready for that in case. I'm hoping so since I too don't get ESPNews, so yeah, don't love when that happens either, but what can you do? And sweet, thanks for info there. Enjoy the game!